The product is supposed to be a grid placed over the midsection to quickly create the appearance of developed ab muscles in the skin. 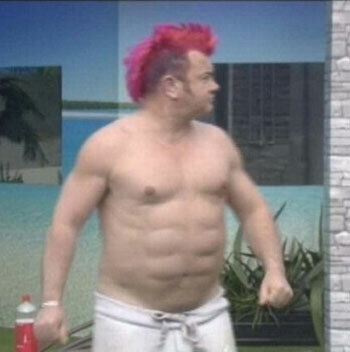 I don’t know who that guy is but his weird “abs” look like they might have been created with the help of the Ab-Hancer. Many times I have come across products that seemed fake but turned out to be real. But in the case of the Ab-Hancer we have a product that seems fake and is fake. A web search for “Ab Hancer” turns up no official website nor any retailer selling this item. The only websites that come up in the search results are humor and pop culture blogs laughing at the AbHancer and/or questioning its authenticity. One big clue would be the text on the box that says, “Recommended by pseudo-athletes.” There is no such thing as a “pseudo-athlete,” and I doubt any real product would be touting their recommendation if there were. The Ab-Hancer inhabits the twilight between absurdity and plausibility occupied by prank boxes. 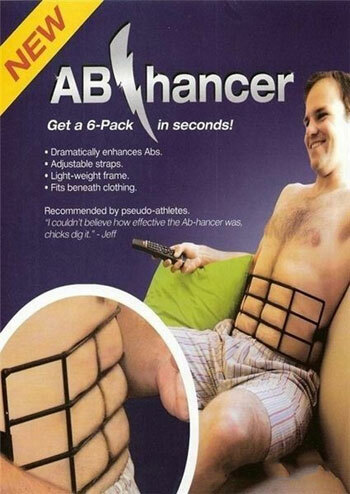 I strongly suspect the Ab-Hancer image that is currently going viral is actually from an old, out-of-print prank box. Still, if men turned Slim Ts into a bestseller then it is not too outrageous to believe that AbHancer could find its very own market of vain males. His abs are fake but he did not use the ab hancer. This reminds me of Homestar Runner’s Ab-Abber 2000… though, that was basically just a Sharpie and you drew the fake abs on.